Karen Woodward: Today we have a real treat, a guest post from Max W. Miller on finding your brightest fire, your passion, that creative impulse that haunts you if neglected. Take it away Max! Is Writing Your Brightest Fire? Yes, it haunts you—everywhere your life turns it’s there, during happy times, during sad events, and even when you’re not thinking about much of anything, the gift of writing is there to bring you stability! You turn to it no matter what state your mind is in. Creating music through words has been the ‘Brightest Fire’ for many who have yet to fully realize it. Maybe that’s you, if so, you cannot move forward into a fulfilling career choice for the future until this strong creative gift becomes a part of that future. Whether it becomes a full-time career or an add-on to an existing work schedule, your brightest fire must burn. So what exactly is this brightest fire thing anyway? Your Brightest Fire is your strongest creative gift; sometimes it is hidden deeply inside the core of your subconscious. Imagine what it takes to get to the core of an apple. It takes quite a bit of biting to reach the core. Hopefully, you will begin to realize that in all your times of stress and discontent, peace and love, you always picked up pen and wrote expressions from the heart. Could it be that an unseen hand was guiding you toward your brightest fire? Life’s circumstances forced me to slide around on the glossy skin of my apple, jumping from career to career—never allowing myself to bite down beyond these jobs that did not satisfy my inner passion. Circumstances can hold you in the ‘Survival Zone’ a place of scrambling to make the rent. It is during these times your head should turn and look back; remember the creative side of you, the thing that when you carve out time to do it, it brings you courage. If writing is your brightest fire, it doesn’t matter how long or how hard you try to convince yourself that the burn is just a fleeting hobby—something you do when you’re bored. It’s bubbling up at all stages of your life. You know that there’s more to this writing thing, you know that this haunting is actually an appointment in time, a date you must not cancel. It will take time to bite through to the core of where the “seed of your fire” burns. It doesn’t matter how young or how old you are you must understand. Many are confused about the difference between what they do for a living versus what they simply do—nobody taught them how, they just do it. To distinguish between what you do to survive and what you do because you have a calling/haunting is not always easy. Remember the seed that springs out of your core. Some people hit it on the head, like Michael Jackson and Elvis Presley; they found their core early in life and became rich and famous on what sprung out of the seed. You have a core that contains a seed. Go back to the beginning and find the thing you've maybe forgotten you have. Is writing your Brightest Fire? Then began migrating from what you feel you have to do, to what you are passionately bound to be. Do something with your writing today! Karen Woodward: Thanks Max! A wonderful, and wonderfully inspiring, article. What is your fire? We all have one. For some of us it's writing, for others it's climbing, or hiking or reading, or ... well, the list is endless. 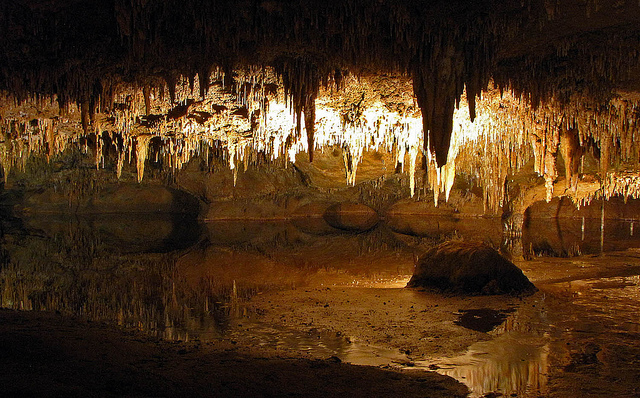 Photo credit: "luray carvern" by scott1346 under Creative Commons Attribution 2.0. I have several brightest fires, but the brightest of them all are writing and Reiki. Ah Reiki! I tried that once, it was extraordinarily relaxing.